The project involves the redevelopment of the ANU Union Court and University Avenue precinct based upon the five principals of people, physical environment, planet, product and program. 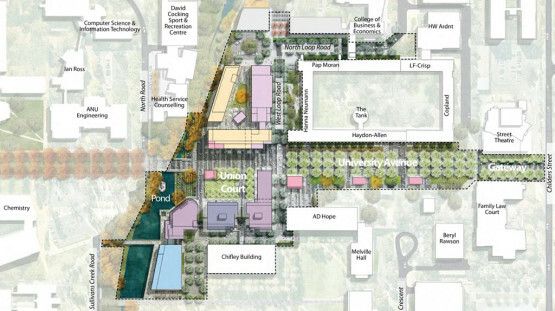 In the development of Union Court and University Avenue, a unique opportunity is provided to incorporate the use of technology as a means of establishing a Smart Campus Environment. This method of differentiation will help to reinforce ANU’s position as Australia’s leading University and a place of distinctive excellence. The commencement of the overall project necessitates the need for relocating a range of amenities and services for a period of time while construction is undertaken to create a new university heart. This requires a “Pop-Up Village” to be created. The Union Court and University Avenue redevelopment will force the temporary relocation of ANU’s retail heart, student services and common spaces. To house these integral uses, a Pop-Up Village will reinvigorate campus life during the period of construction and transition. Philip Chun is providing reviews and recommendations throughout all stages of the project from initial conceptual design stages to the completion of construction. Our involvement from the initial design stages will allow for incorporation of universal design principles and best practice accessibility options as an integral part of the design development.